UCLA football coach Jim Mora discusses true freshman QB Josh Rosen, what the Bruins need to do to win the Pac-12 and more. UCLA may be the most fascinatingly difficult team to project this season. With 18 starters, including 10 on offense, back from last season’s 10–3 squad, the Bruins could compete for the Pac-12 South crown. However, the lone offensive starter who doesn’t return is the quarterback, second-team All-Pac-12 honoree Brett Hundley. 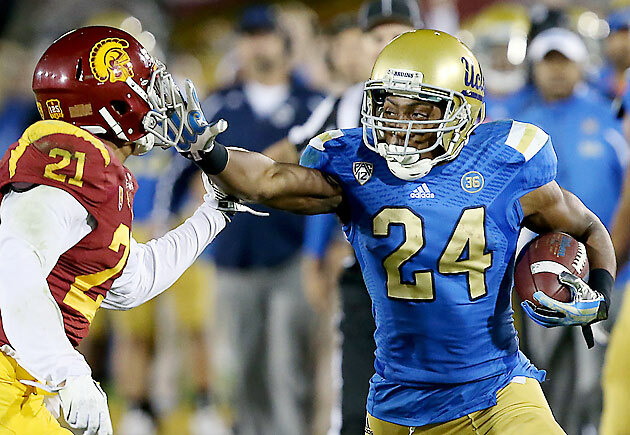 Adding to the uncertainty is whom UCLA is likely to use to replace Hundley this season. Although still locked in a competition with junior Jerry Neuheisel, true freshman Josh Rosen is expected to win the starting quarterback job. Rosen was the top quarterback and No. 2 overall recruit in the class of 2015, according to Rivals.com, but for all his potential he’ll still have to learn on the fly how to compete at the college level. With Paul Perkins, the Pac-12’s leading rusher last year, an experienced offensive line and proven receiving options, Rosen takes over a pretty ideal situation, assuming he wins the job. The Bruins’ defense should be stout, too, led by the freakishly athletic Myles Jack and pass-rushing linebacker Deon Hollins. After missing out on the Pac-12 championship game due to a loss to Stanford in the final week of the regular season, UCLA enters 2015 primed to contend again. But to do so, it’ll have to survive a daunting run through the Pac-12 that includes trips to Arizona, Stanford and USC as well as a home date with Arizona State. SI.com caught up with Bruins head coach Jim Mora to discuss the difficulty of that schedule, why Rosen could succeed and how UCLA can finally win the Pac-12 after winning nine or more games in each of Mora’s three seasons. SI: After coming up just short of winning the Pac-12 South last year, what’s the attitude like entering this season? Jim Mora: We’ve had a very productive off-season. Our guys worked very hard and were very focused. Spring was excellent, 15 very, very productive practices. I think everyone’s excited about this season. For us to have success this year, we have to find a level of consistency that has kind of eluded us. I think it has eluded us because we’ve been a young team. We’re still a young team. We’ve only got three senior starters, I think. But these guys have played together now for a couple years, so I think we’ll hopefully find that consistency. The biggest question for us is undoubtedly the quarterback spot, which is relatively important, as we all know [laughs]. It’s kind of funny, “Oh, you’ve got 10 returning starters on offense. God, that is awesome.” Yeah, but the one that we don’t is the quarterback. SI: What has Josh Rosen done to put himself in the mix to start as a true freshman? ​JM: Well, first of all he came in early. He enrolled in winter, so—winter, spring, summer—by preseason camp he’s completed three quarters of school. He was able to compete in our winter conditioning program, he was able to participate in spring practice. There’s a certain comfort level that he’s gained from being able to do that, and then there’s a certain level of confidence that his teammates have in him because they’ve been able to get to know him and watch him perform and compete. SI: Five teams in the Pac-12 South won nine or more games last year. What aspect of the division is the toughest to prepare for? JM: The variety of offensive schemes. You’ve got Southern Cal, who is different than Arizona State, who’s different than Arizona, who’s different than Utah. And then there are some really good quarterbacks in the South, really good quarterbacks. I’m not saying they’re all gonna go on to be NFL players, but they’re all really, really productive college players and tough to defend. I think there’s outstanding play-callers. You look at [Mike] Norvell at Arizona State and Rich Rod and those guys. These guys are established play-callers and they keep you on your toes as a defensive coach. It’s a challenge every week. 2015 Pac-12 preview: Is this college football's new toughest conference? ​SI: Your offensive line last year had some struggles early but seemed to come together later in the season. Was that just a matter of building chemistry or was there more behind the improvement? JM: I think it’s guys playing together that are good players. Gaining that experience together creates what you were calling that chemistry. To me it’s consistency, too. We just had a lot of movement on the offensive line because of injuries. We didn’t have the quality depth that we have right now. Sometimes when you go through those struggles like that, what happens is you’re forced to play some guys before they’re ready, so you take an initial hit. But in the long run it helps you because now all of a sudden they’ve got that experience that you’re looking for. Right now, I feel like our offensive line could certainly be one of the strengths of our team. We’ve always been able to run the ball very, very well. When I watched them in the spring, I didn’t see any dropoff in our ability to run, but I saw more consistency in terms of our protection. SI: What are your expectations for Paul Perkins this season after he led the Pac-12 in rushing last year? JM: Paul is a really fine player and very underrated. He’s very under the radar, nobody even knows who he is. I just want him to run hard and take care of the ball and be consistent in protection, which he’s been really good at. And then I want to make sure that we give him a break and don’t wear him out and keep him fresh for the end of the game. Fortunately we’ve got some really, really, really good running backs on this team besides Paul Perkins: Nate Starks, Steven Manfro, Craig Lee. We’ve got Soso Jamabo, who was the No. 1 running back in the country coming in as a freshman, and a guy named Bolu Olorunfunmi. So we’ve got some backs that can take over for Paul when we want to give him a break, but Paul’s the kind of guy that, to me, seems to get stronger as the game goes on. He’s put on about 15 pounds this off-season. He looks just great. ​SI: What’s the biggest impact that Tom Bradley has made since he was hired as defensive coordinator? JM: I would say subtle changes in our scheme and the way that we do things that I hope will help us, a little bit more of an aggressive mindset in terms of pressure, adding guys to the rush—not just rushing four but going five and six and sometimes seven. Just that layer of experience that really I don’t have at the college level and really no one on our staff had at the college level. Just seeing that and seeing him in action and the effect he’s had on our players and the way they’ve responded to him, the guys is an amazing person, and our players have really taken to him. ​SI: What led to the decision to move Myles Jack to inside linebacker this season? JM: In this conference we play much more nickel than we do base. When we play nickel, Myles plays inside, so really it’s a subtle change. It’s nothing that is earth-shattering. In our base defense, it does give us a chance to put him in the middle of the field rather than on one side or the other, where teams can plan to go away from him. With him in the middle and his great speed and instincts and playmaking ability, it should theoretically be a little bit more difficult to get away from him. SI: Are guys like Jack and Deon Hollins who you look to to help offset the loss of Eric Kendricks? ​​JM: Certainly, and Kenny Young, who started last year as a freshman at inside linebacker. He’ll play Eric Kendricks’ spot at mike linebacker. Last year, he played the other spot. We’ll move him over and then move Myles into the spot that Kenny was at. Deon is more of an outside pass-rusher. The combination of Kenny and Myles, and we’ve got some other pretty darn good linebackers that will step in and play as well, Isaac Savaiinaea and some guys like that. You don’t just replace an Eric Kendricks. He won the Lott [Trophy] and he won the Butkus [Award]. He’s pretty damn good. But I think we’ve got some guys that can step in and do a good job. SI: With the number of returning starters that you have, the idea of the unknown x-factor doesn’t really apply. But who’s a guy that’s going a little under the radar? JM: Sometimes our wideouts get the short end of the publicity stick. People don’t really know too much about them. I think one of the really fine players on our team is Jordan Payton—who’s been a starter since he was a freshman but no one really ever talks about him—incredibly consistent, very tough, big blocker, all of those types of things. I’m excited to see how he does this senior year. He’s worked hard for four years now. I think he’s going to have a hell of a year.